The Furnace Engineering Infrared Heaters are designed for rapid surface heating of all products. 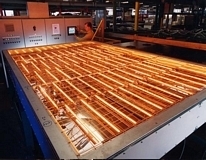 Infrared heating is a very fast and efficient way to transfer heat to the product either in batch or continuous method. Different product properties respond to different infrared wavelengths in Infrared Heating. As example, the Medium Wave Batch Heater is used to rapidly heat the product (plastic automotive component) and hold the temperature constant while adhesive is being applied.